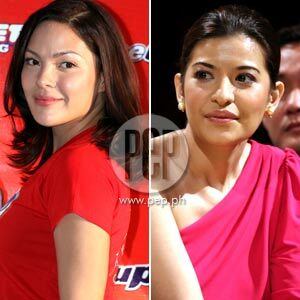 No pain, no gain: Assunta de Rossi’s (right) effective portrayal of a heartless villain in Lovers in Paris earned lead star KC Concepcion’s (left) deep admiration. "Ang galing niya kasing umarte kaya mahihiya ka kung ’di mo pagbubutihan ’yong eksena mo with her," KC told PEP (Philippine Entertainment Portal) in a recent interview. Credit goes to both Assunta de Rossi and KC Concepcion for their intense portrayals in ABS-CBN’s primetime series, Lovers in Paris. KC has been the unlucky recipient of Assunta’s abuses both physically and verbally as dictated by the latter’s villain role. In one particular episode shown last week, Assunta engaged KC in a violent confrontation match complete with hard slaps and hair pulling. In real life, however, KC has nothing but good words for Assunta and her effectiveness in carrying out a villain character made even more believable in front of the camera. "Alam mo sa totoo lang sobrang inalagaan ako ni Ate Sam [Assunta’s nickname]," KC told PEP (Philippine Entertainment Portal) in an interview last November 12 at Market! Market! Activity Center in Taguig City for the Close-Up Halik Meter Challenge. "Sobra niya akong inalagaan na parang wala akong naramdaman at all na sakit," said the daughter of Megastar Sharon Cuneta and ’80s matinee idol Gabby Concepcion with obvious relief. KC said she watched the particular episode and was shocked by the turnout of the scene, prompting her to remark while staring at the television set: ’Grabe parang ang sakit-sakit." KC was able to witness Assunta’s experience and knowledge in dealing with delicate scenes by balancing empathy for an co-actor without sacrificing the visual and emotional requirement needed at the time. "Siyempre pinag-usapan namin kung paano ’yong choreography [of the scene]," confessed KC. "But ang galing niya kasing umarte kaya mahihiya ka kung ’di mo pagbubutihan ’yong eksena mo with her." The relationship between the two in real life is contrary to what is seen by the show’s loyal viewers. "Thankful din ako dahil naging close kami... Napalapit din ako sa kanya," mentioned KC in closing. A local rendition of the hit romance-comedy Koreanovela, Lovers in Paris is KC’s debut primetime series after an anthology special and string of guest appearances. The previous week also featured KC’s first onscreen kiss with leading man Piolo Pascual. Lovers in Paris airs weeknights on ABS-CBN.